Hi Fabricista's I am back with my newly finished wrap dress and newly groomed doggie Buster. He was in on the picture action again and it's always fun to ask his opinion on my recent make. He is a Tim Gunn fanatic and fancy's himself a bit of a fashion aficianado- that is when he's not chasing squirrels or barking at passerby's. I own several Palmer/Pletsch books on fit and they are a great reference to have on hand for garment sewing. I have always wanted to try the Palmer/Pletsch fit method from start to finish and with this kit I was finally able to do just that. I began by watching the fit-along videos by Julie and Melissa Watson. For a sewing person who loves to see how others work out their fit issues- it was exciting. If you haven't watched the series follow this link. I watched them in bits and pieces over the course of a week and there were so many helpful hints. You can see from my tissue fitting that I had several changes to make to the paper pattern to get a better fit. It is helpful to have a friend help you pin out anything in the back, my husband was a huge help, but for anything that he didn't understand I just took the paper off, pinned the alteration out and tried it on again. You can see from the pattern that I had to add a back shoulder dart for narrow shoulders, altered the front shoulder, pinched out a dart in the neckline, made a sway back adjustment, and let the bottom of the back dart out a smidge. Along with these changes I made my normal grading alterations, a size 10 at the bust, 12 at the waist (which I ended up taking back up to a 10) and a size 14 at the hips. 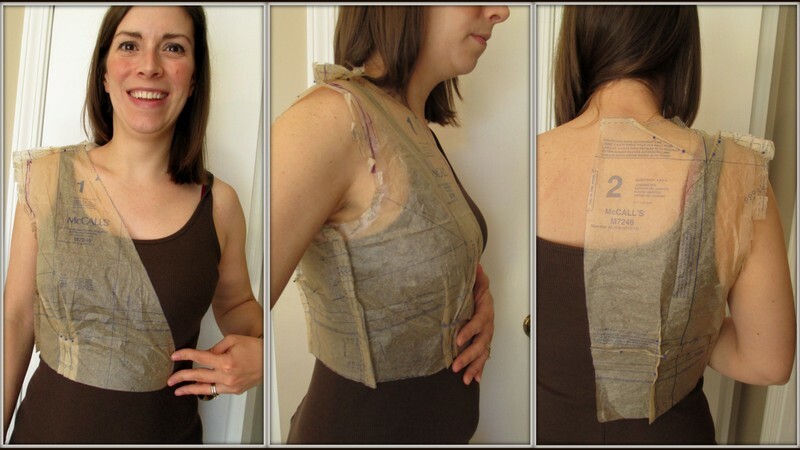 I also chose to extend the tucks up by about an inch to come right under my bust for a smoother, closer bodice fit. One piece of advice I might add about the pattern is that facings don't always like to behave in knit patterns, in my experience. I chose to go ahead with them in this dress and added some extra fusible tricot interfacing to the neckline before adding the fused facings. I was very worried that the neckline would stretch. I think next time I will used clear elastic to finish the neckline since, with movement, the facing are somewhat stiff and shift. Above you can see the facing is popping out in the center back neckline even though I tacked it down at the shoulders. You can find a tutorial on using clear elastic to finish a knit neckline here. The fabric included in this kit is a beautiful double knit and can be found here. I loved working with this fabric, it had good stretch recovery and had a nice substantial weight. And the fabric is very forgiving when seams need changing. I decided to ask Buster about his final verdict on my new dress and he thought he'd used the nibble test to check the fabric. It passed the nibble test with flying colors. Next, I asked him about the color of the dress and coordinating shoes. He approved of both- he was especially fond of the color of the dress since it matched his fur quite nicely. He did note that if I would add one lime green accessory we would coordinate perfectly. Overall, I was very pleased with the final fit of this dress. I give the fit-along tips two thumbs up especially since the resulting dress fits so nicely. I know I will carry the skills learned through this process to any future fitted bodice patterns. I hope this encourages you to take a peak at the fit-along series and maybe even enter the fun contest Fabric Mart has put together- there are some great prizes!! I love your wrap dress! This pattern matches the fabric. You did a great job. Thank you! Fabric Mart did a great job matching up the fabric and pattern, the double knit really suits this pattern. As always very nice! Thanks for the tip about the interfacing. The dress looks nice with the red flats. Wearing heels would dress it up for a night out on the town, date night. Lovely indeed! Thank you! I love the splash of red with a black and white combination too!